Okay, to be honest, I was self-conscious, at least at first, but I spent four days posing these little plushes in the craziest places and after a while you have to accept your own insanity and run with it. It helps when you share your insanity with others, and at the Blog Paws 2011 Conference, there were plenty of crazy/nice people who do the same kind of crazy/fun thing I was doing. Two of my co-conferencers were Stacy Winnick of Dobby’s Day and Angela Mitchell of Whek.tv. They both brought plushies. Angela brought Decoy Piig, the little guinea pig plush in the photo above, and Stacy brought a nameless naked mole rat. 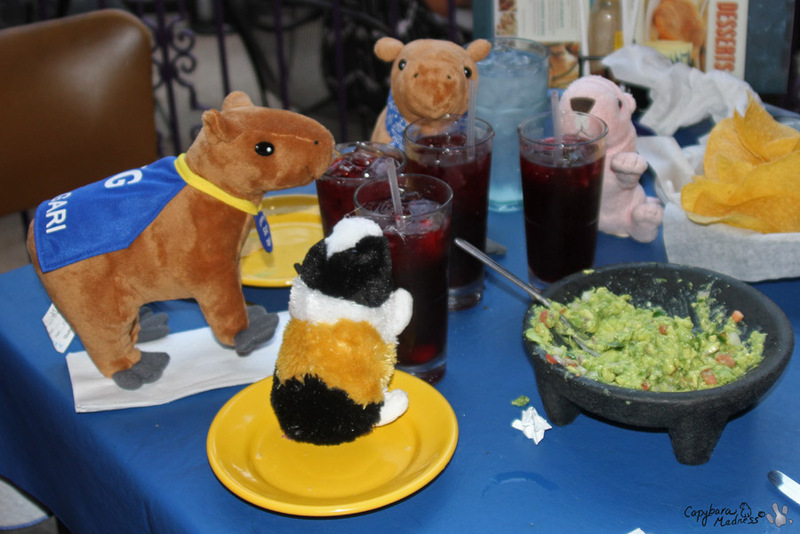 Here we were out at a nice restaurant in the Washington, D.C. area and we all got up to pose our plushes having a drink. You’re probably wondering who the bad influence is in our group. Well, it is all of us. And we’re not the only ones! 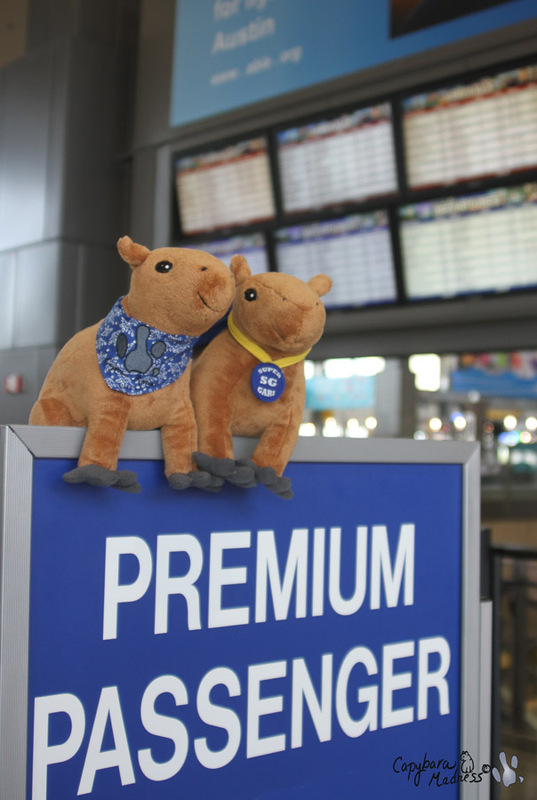 Plushie posing is a common pastime among pet bloggers, or at least those who show up to Blog Paws conferences. 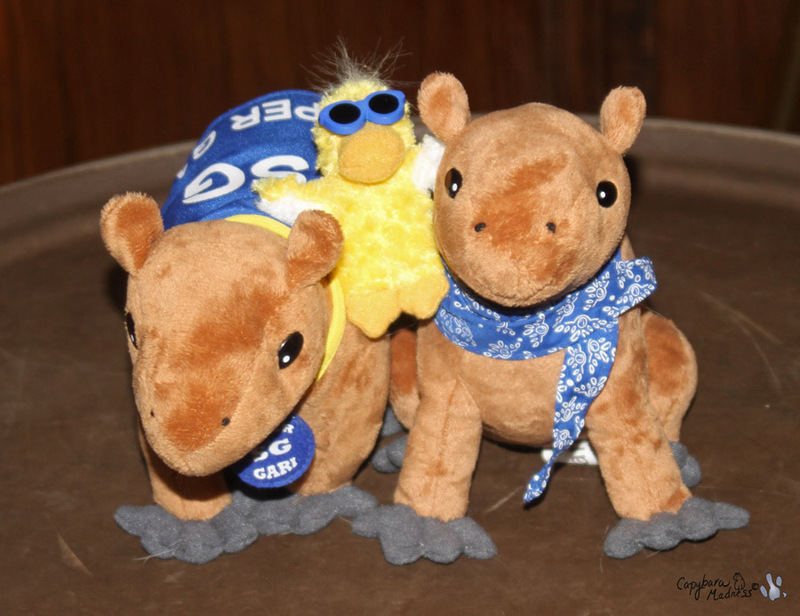 The above photo shows my two plushies, Capycoppy and Super Gari, with the world famous George the Duck. As you can see, George is a plushy. What you might not know is that he is a plushie with his very own blog! That’s taking it a step farther than I’m willing to go, although I do enjoy reading his blog which is not as crazy as it sounds. I took over 400 photos during my trip to the conference so I hope you don’t mind if I take a few posts to cover everything that happened. 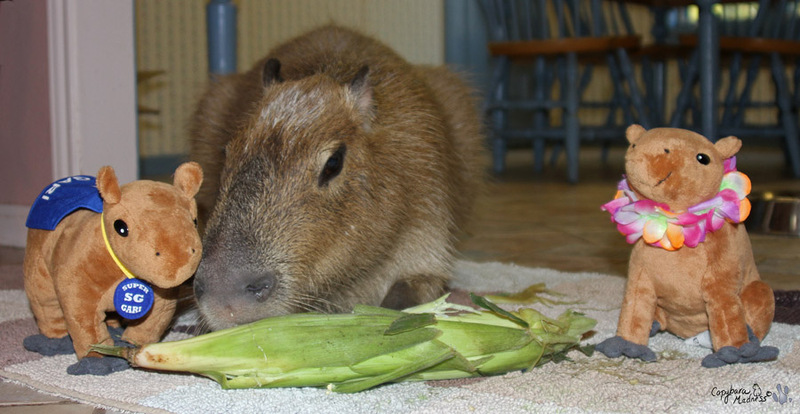 You can be sure that there will be plenty of photos featuring Super Gari and Capycoppy! I’ll leave you with a photo of Gari with the two plushies. Next year I hope to be able to take him to the conference. That’s going to involve a whole lot of training between now and then. Gari has come so far in the past seven months though that I think he will be able to face the long drive to Salt Lake City and all the dogs and other pets that will be at the conference. Wish us both luck with that, we’re going to need it. I love the photos and can’t wait to see more! I would not be self-conscious at all, I do things like this often and don’t really care who thinks what of it. LOL! I think it is fun to be silly, no matter your age. Sounds like you had a great time, Melanie…and we all know Gari is happy to have you back home (and relieved you were not stuck in DC with the hurricane). I would have LOVED to have been at Bergstrom the day of the plushie posing!! How much fun was THAT!!! I really like the new Super Gari plushie, especially that he is wearing his medal and a cape! Salt Lake City will be another adventure. I can not wait to read your blogs from there! Meantime, I look forward to hearing more about Blog Paws 2011. I know Gari’s glad you’re home!!! I love any grown-up who still appreciates their toys. I don’t go anywhere without at least one of my rubber ducks! Thanks for the fun! Posing with the “plushies” seems perfectly reasonable, but the one thing I have learned about unconventional behavior is that intelligent people have no problem with it, but uneducated people seem to feel threatened by any behavior that is different to the way they would behave, and stare rudely; there are probably sound reasons for this vise a vie (spelling?) evolutionary psychology. (I have a chronic foot injury so I have to go up steep hills backwards! I was determined to get to Angel’s Landing when we visited Zion National Park last year and there was only one way I could do it. I just got huge smiles the higher I climbed, perhaps because fitness equates with intelligence.) In Britain we have a tradition of the great British eccentric. After the terrorist bombings in London in July 2005 The Daily Telegraph (our most popular broadsheet newspaper and one which has interviewed Caplin ROUS) ran a survey to see what it meant to be British. Eccentricity came top! So I am all for eccentric behavior.